This appealing appetizer is certainly worth of your attention; especially if you enjoy an easy, make-ahead smoked fish nosh that’s a bit different from the status-quo smoked whitefish or smoked salmon types of spreads. I saw the recipe in a Vitamix cookbook and in a brief glance knew it would be a spread I’d love. 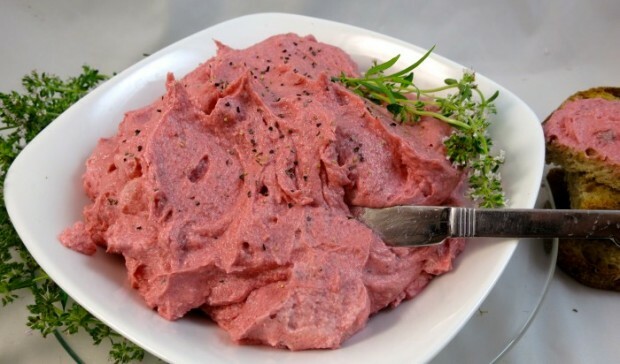 Certainly the ease of preparation, but also the color, derived mainly from the beets, which is so lovely (particularly paired with black breads). I switched up the herbs and amounts to accommodate the ingredients I had on hand. If you’ve the time, roast the beets instead of buying them prepackaged; it adds a wonderful earthiness to the finished product. If time doesn’t allow, Melissa’s Beets are a good substitute. I used a Vitamix, but an strong-engined processor should work just fine. I had leftovers that were fine after 24 hours, yet the subtly of the flavor profile diminished a bit. Place all ingredients into a food processor or Vitamix. Turn more on and blend until smooth; season with freshly ground black pepper.